Palmer Luckey is back and he’s innovating… kind of. We all love a good comeback story. The idea of a person who’s made questionable decisions and slowly declined suddenly making positive changes to themselves and learning from their mistakes is appealing. To us, it means that any of us, at any age, can go from our lowest point and rise higher than ever with enough integrity and determination. 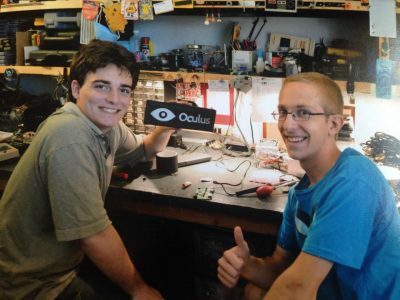 And we had hoped that would be the case for Palmer Luckey, creator of the Oculus Rift. Luckey made the news last year as part of his leave of Facebook wherein he resigned. Some say it was the $500 million dollar lawsuit from Id Software; some say it was the fact that he donated to Nimble America, whose entire existence went nuclear in September of last year. It’s hard to tell. But it was reasonable to assume that Luckey would be back with some new technological startup, especially one considers his estimated worth of $730 million and the fact that he is a well-known tech startup success story. And sure enough, he’s back, and he’s trying to help the Trump Administration. His current, as-of-yet-unnamed startup, is a company developing surveillance technology to be “deployed on borders between countries and military bases” according to sources at the New York Times. There he was quoted as saying “We are spending more than ever on defense technology, yet the pace of innovation has been slowing for decades. We need a new kind of defense company, one that will save taxpayer dollars while creating superior technology to keep our troops and citizens safer.” These same sources list the use of lidar (most popularly seen in self-driving cars), infrared sensors and cameras as opposed to a physical wall and would be less intrusive. Sources also say that Peter Thiel, investor and noted Trump supporter and tech advisor, planned to support Palmer Luckey’s startup by running the investment fund, though that is yet to be concretely proven at this time. The problem is, that’s where the information breaks down. It is known that Luckey and Charles C. Johnson, owner of the website GotNews.com a site noted for its controversial fake news stories, met in the white house US Interior Department (DOI) head, Ryan Zinke according to Gizmodo. But beyond Gizmodo’s single still image indicating that to be true we have no idea how this ties to his startup, if at all. It’s reasonable to assume so, but Palmer Luckey is more likely to comment on his favorite anime then his new startup. For now, Luckey’s startup is currently self-funded, and it remains to be seen if the White House will take to this idea of innovating their borders digitally. We’ll see what he really comes up with here. The story does not touch on exactly what he has in mind and the fact that he operates a fake news site might have a lot to do with that, don’t you think? We have seen self-funded companies do just fine. As soon as they blow the windows out with their awesome idea, there will be tons of companies getting in line to fund the project. The idea is not a bad one, as others have mentioned. I think with all of the tech interference these days, that could be an issue with such a system that is so wide spread. Of course, there are cell phone towers every other mile and that seems to help, so maybe this system to keep the borders safer is one that will work? This is not a bad idea. I hope this guy does not run into people trying to tell him otherwise. It really sounds like it would work and the resources to monitor it would be cut for sure. A win-win. So, instead of up putting up a wall, there will be sensors and cameras watching the entire stretch. This does not sound like a bad idea, but then what is done with all of the footage and other data recorded by the sensors and cameras? Now, this is a great idea. Sensors and cameras that will do all of the work. What is wrong with that? I do not see anything wrong with a virtual border wall. However, what is and what can be done with all of that information is what is going to be the problem.